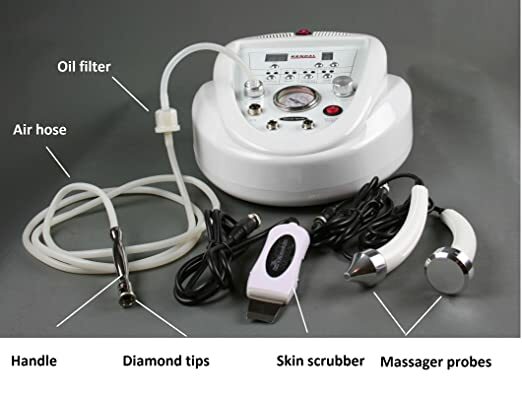 This professional multipurpose Diamond Microdermabrasion machine is good for refining, rejuvenating and smoothening skin. The 3-in-1 functionality describes three built in professional functions. 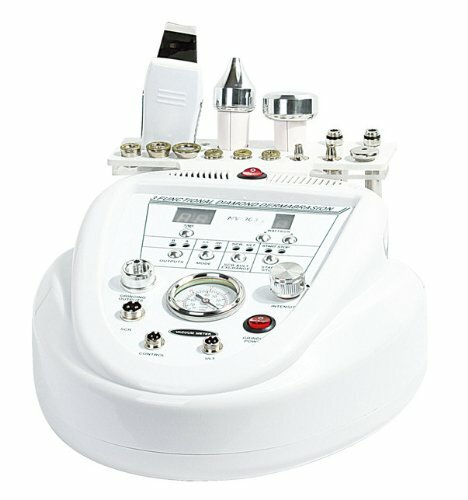 This professional microdermabrasion machine comes with two dermabrasion stainless steel handles. The package also contains 9 pieces of diamond tips of several sizes. Three large ones, 1 medium, 1 fine, and 1 coarse. It has 3 medium in which one is fine, a medium, and a coarse 1. There are 3 small tips in which 1 is fine, 1 medium, and 1 coarse tip. Inside the package there are 360 cotton filters, two cylinder-plastic oil filters, air hose for the diamond filter and a power cable. You need to apply soap to your face first and then set the time and level before starting it. Move it over your face in a scrubbing manner to remove soap and water. Apply a little pressure on the areas you need to exfoliate. When you are done, you can apply a moisturizer and massage it on your skin using the ultrasound. The Diamond Microdermabrasion can be used to perform several functions that include removing skin debris and scars. Blemishes and wrinkles on the skin can also be removed, as well as evening out irregular pigmentation on the skin. The Diamond Microdermabrasion can be used to massage your skin, as well as the surrounding tissues in order to get rid of any fat deposits and undesirable wrinkles. This is done through the use of the two massager probes. You can also scrub your skin to clean off dirt present in the pores hence making your skin cleaner and fresher. While this machine is created for professional use, there is limited demonstration on how to assemble it. Lack of this information is risk to the machine’s and its components use as well as the user’s skin. Kendal 3-in-1 microdermabrasion machine may have a higher cost, may take time to assemble but it delivers its purpose to your expectation. The machine is portable hence convenient to as compared to other large machines for the same purpose.